What changes have you had to make due to raising children with special needs? 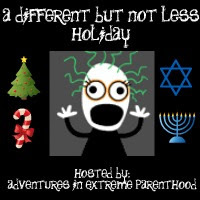 The way I see it, there's two ways to do the holidays with Fragile X/Autistic kids. You can force them through the traditions and rituals that make it a "typical" holiday. Force them to visit Santa. Make them sit in a crowded room full of relatives and open presents in front of everyone. Strap them to a chair so they'll sit at the table with the family for a nice Thanksgiving, or Christmas dinner. In other words, try and force them to act like "typical" kids. Or, you can relax on all the holiday customs and activities. You can decide to spare your kids the whole Santa Experience. Let them hide out in the other room during the present opening extravaganza. Allow them to eat dinner at the small table in the kitchen. We've done both. The last couple of years I forced the boys to see Santa. To sit for a picture with him. I alternated between feeling like "this is hard, but good for them" and "this is totally not worth the agony." This year we tried to find a happy medium. We all went to see Santa, but the boys were allowed to hang around the outskirts of the Santa room, while Aliza had a nice visit with him. As it turned out, AJ lingered sort of near Santa, while Zack stayed as far away as he could. And it was okay. As far as opening presents was concerned, we took a "wait and see" attitude, because last year we got both boys interested in actually opening presents for the first time. This year AJ was all over opening presents. He didn't care if they were for him or not. He was happy to be ripping paper. Zack didn't want much to do with the whole scene. We tried to entice him with presents wrapped in Dora the Explorer wrapping paper. We tried tearing off enough paper just to show him he would like what was inside. But it didn't work on him. He struggled mightily with the crowd of people, even though it was his own family, gathered around the tree. So we let him go back downstairs. No point in making him miserable. We had an extended family gathering this weekend, and we planned ahead. See the thing is, we know the boys will struggle with getting through it, but there's no way Aliza wants to leave early. She has a good time with her cousins. So, we went to this family gathering in two cars. Both boys get pretty wild. They run around the house from room to room, upstairs and downstairs, in the basement and kitchen, like wild animals desperate to escape a cage. We brought the portable DVD player and some of their favorite movies, but they couldn't settle down. So after chasing them around for about an hour and a half, I brought them home, where they could have their sandwiches and then have a bath and settle down before bedtime. And this worked out perfectly. The boys socialized just a little bit, all the family got to see them, and then they got to come home early, but Aliza didn't have to come home yet. I say it worked out perfectly because this is what we planned. Before we came with a plan, nothing worked out perfectly. Either one of us drove around with the boys for awhile so that Aliza could stay, or we upset her by leaving earlier than she wanted to. Neither situation is preferred. A couple of years ago I'd get pretty sad that the boys couldn't handle social situations like other little kids. But we have adapted to something that works for us. I am glad you guys mad it work in your own way. I bought gifts for all my students and was pleasantly surprised that they all were so interested and participated in the opening process. I can't wait to hear how all of their Holiday breaks went when I go back to school today. Our family has also done the 2 car thing to go to events. It really is the best way to ensure everyone has a good time, even if for some of them the best time is getting to head home and do their own thing again. I'm so glad you joined the Blog Hop! It sounds like you found the right blend for your family. What I'd love is to have a way to get the extended family to support the little alterations that need to happen for a special needs child. I guess I'm just dreaming about that though! Now my son is old enough to be left alone when we go to parties that are too stressful for him we take along his portable DVD player and park him in a room by himself. He wanders out from time to time and escapes back to his refuge when it gets too much for him. Even for his birthday parties we tell him to go into the room next to the party room for a break if it gets too much. He did that the first time I suggested it for a short time. Since then the fact that he can do it has reduced his stress levels before and during the party a huge amount. He never wants many friends at his parties though so we stick to his closest mates.